How is the Age of a Rock Determined? - READY... SET... QUESTION! Darwin claimed there to be an “imperfection in the geological record.” He stated in The Origin of Species that “geological formations of each region are almost invariably intermittent; that is, have not followed each other in close sequence.” Geologists are still wrestling with this conundrum today. Sediments become overturned. Lava flows cut through ancient bedrock and fill their path with granite. Rivers cut layer after layer and carry fragments of older layers to new locations depositing composite layers. Tectonic forces lift lower layers and create mountain tops out of rock containing fossilized waterborne organisms. No layer is perfectly in place. Evolutionary biology is completely intertwined with deep time, eons upon eons. So, the real issue comes back to which rock layers are considered most ancient and which are considered to be most recent. If we are to compare fossil evidence of varying tree of life locality; timing is of the essence. So then, how might age be applied? In The Origin of Species Darwin gave an estimate to the erosion process when he said, “a cliff 500 feet in height, a denudation of one inch per century for the whole length would be an ample allowance,” making said cliff a flat plain in 600,000 years. Yet, it is also likely for an entire hillside to peel off into the ocean after a heavy rainstorm. Denudation and the laying down of rock layers takes place at varying rates, and anyone’s guess to the timing is up for debate. The United States Geological Survey holds the stance that, “the actual length of geologic time represented by any given layer is usually unknown or, at best, a matter of opinion.” So, in order to have a geologic age more concrete than opinion, some believe the best way to determine the age of a certain layer is to determine what index fossils are contained in such layer. Index fossils are used to date and correlate varying rock strata. For example, if one were on a hunt to find a 540 million year old rock, then a 540 million year old index fossil would be the best clue to look for. An index fossil of the right age is what one should look for when identifying rocks from the Paleozoic, which began roughly 540 million years ago. Paleozoic strata is not comprised of one type of rock, in fact, its composition varies quite drastically and ranges from limestone to quartz-feldspar schist. One could find Paleozoic rock on a mountain top or in a riverbed. The most common determining factor when identifying this particular layer of strata is finding an index fossil. Trilobites are what some people call a rudimentary organism and a good index fossil to look for when identifying Paleozoic rocks, but why? Look to Darwin’s tree of life. It is quite obvious to see that rudimentary life is at the base of the tree and the least rudimentary is toward the top. 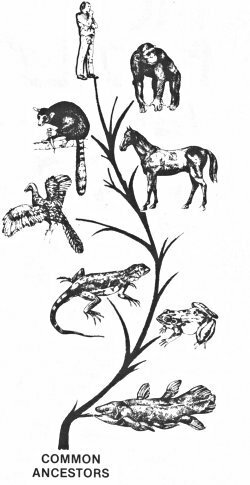 Of course Darwin was the first to explain that natural selection was how he believed life to have become so diverse, but he was not the first to see life as changing from simple to complex. The Victorian era was ripe with young naturalists who spoke of rudimentary organisms changing into less rudimentary ones; this era was when the geologic periods were invented. Of course, the most basic of organisms were placed into the strata at the bottom of the chart and as the complexity of an organism increased, it was placed higher on the chart. Then a rough estimation of how long it might take for a rudimentary organism to diversify into more complex species was bracketed over that particular era. The idea of index fossils must be examined. Is claiming that fossilized organisms are contained in certain rock layers based on when said organisms evolved into existence free of bias? Does not the mentioning of index fossil presuppose the validity of evolution? So then, is it accurate to say that using index fossils to validate evolution is free of circular reasoning? How scientific is it to use the idea of index fossils when attempting to validate or falsify evolution? According to the National Parks Service, the usual method geologists use when giving an age to a specific rock layer is by identifying index fossils. Yet, is the giving of age to rock formations based on index fossils an accurate method? Is the categorization of a fossilized organism into one of the geologic periods free of bias? If a fossilized mammal were to be found and the researcher chose to date the specimen using the index fossil method, the chemical composition of the rock encompassing the organism would not be analyzed. Mineral content and proximity to the surface would also not be a factor in determining its age. If a researcher uses the index fossil method to date a fossilized mammal, the specimen would be placed in or after the Mesozoic because it required a longer amount of time to evolve into a mammal. Yet, if a fossil of a trilobite is captured in the very same type of stone, with the very same chemical composition, containing the same trace minerals, and having a similar depth or proximity to the surface, its age would be classified as being part of the Paleozoic because it is a trilobite and according to Darwin’s tree of life, trilobites are located near the base of the trunk. What empirical data suggests that using index fossils is a good way to date fossils and rock layers?All fields of science that improve our understanding of the world and bring us new and innovative breakthroughs welcome questions. My questions are asked in order to do just that. I want to improve our understanding of the world, so I ask questions. One must stop and ask themselves a question, why do evolutionary biologist feel threatened by questions instead of welcoming them? Thank you for reading my questions. I invite you to continue this journey in my book, What Is Evolution? Previous PostAre Humans Still Evolving? – part twoNext PostWhat is the best evidence for evolution? Maybe you’d be interested in tackling the topic of radiocarbon dating?